The Eden Project in England is a huge, inspirational, and educational destination that will make people of all ages feel like children again. Guests frequently marvel of the size as well as the beauty, all while knowing they are supporting environmental sustainability. 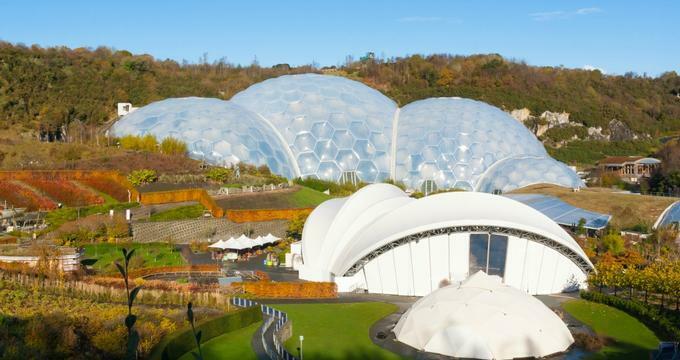 The Eden Project was born out of a china pit in 1995 and, through hard work and dedication, actually set the world record with their drainage system and scaffolding in 1998. The first plants arrived in 2000 and they officially opened their doors to the public in March of 2001. Eden Project welcomed their ten millionth visitor in 2010 and in 2012 they even welcomed the Olympic Flame! Rainforest Biome - The awe inspiring 50-meter-tall rainforest biome is one of the most popular attractions at the Eden Project and is the world is largest “captive” rainforest in the world. Featuring four different rainforest environments’ from across the globe - Southeast Asia, Tropical South America, West Africa, and Tropical Islands - the biome is an out of this world entertainment and educational attraction. Follow the rainforest path as it winds through enormous trees and discover something new around every unique corner. Make sure to check out the Canopy Walkway, the Malaysian Hut, the South American waterfall, the various birds, and the variety of produce being grown in the biome (nuts, bananas, spices, cocoa, etc). Bee Sculpture - The stunning outdoor garden is home to an enormous bee sculpture, set in the flower beds to remind visitors just how important bees are to the pollinating environment. Outdoor Gardens - The outdoor gardens are over 20 acres, featuring over 3,000 different varieties of plants and generally taking just about two hours to see in its entirety. Make sure, if bringing children, to stop by The Nest (a giant climbing frame for them to expend some energy on). Another must see is the Spiral Garden, a garden built to engage all five senses. There are also around 100 cultivar and species of red hot pokers to check out, as well as barley and hops (the main ingredient in beer making!) which is located in the garden’s beer display. SkyWire - SkyWire is England’s fastest and longest zip wire! Freefall jump and plummet in the giant swing or make the loop in the 360-degree swing… the fun is palpable! Admission to the Eden Project is not required to enjoy SkyWire, but it does come with its own admission fee. Eden Project operates is a certified educational charity, which means they are well prepared for school field trips and other educational experiences. To request a field trip, teachers should fill out the request form on the website. An Eden Project team member will be in touch within one week to help schedule. Teachers are also encouraged to visit the website prior to the visit as they provide a large amount of information that is useful to help lesson plan as well as prepare the students for the visit. There are optional team challenges and workshops to add and a complete trail guide as well as information about access for students who may have disabilities. There are available spaces for classes to eat lunch while on the premises as well. Eden Project is frequented reviewed to be one of the most educational rich and diverse places to take students and every visit shows them something new. Visit the Med Terrace for a unique, Mediterranean dining experience. Located in the Link Building and offering a variety of lunch options, the restaurant caters to all dietary choices and requirements (gluten free, vegan, vegetarians, dairy free, etc). Popular choices are sea bass, chicken or lamb tagine, and the affogato. For visitors hoping to take a little piece of their visit to Eden Project home with them, make sure to visit the Project Shop. Considered an ethical gift shop, it offers a wide variety of ethically grown/produced and sustainable choices for the home, to wear, and even for pets!